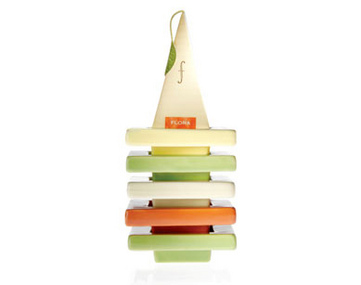 Tea Forte’s set of ceramic tea trays offer a dramatic and festive presentation for serving our Silken Tea Infusers. Return infusers to these trays after brewing to catch the drips. Each gift box contains two trays. An ideal accompaniment to any size of our tea package options. As I’ve professed before, I am not a big fan of gadgets, especially when it comes to tea. Tea, in my opinion, is best enjoyed when kept simple. That being said, I have to admit that these ceramic tea trays from Tea Forté are REALLY cool! 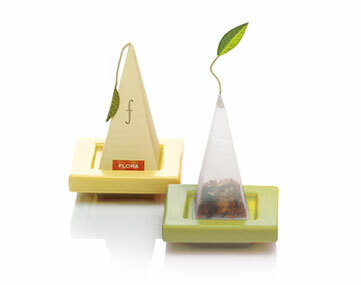 Not only do they provide a great service (keeping tea preparation area neat and tidy), they make using tea sachets fun and stylish. Even as someone who loves my loose leaf tea – I can still really appreciate this nifty little tool. Imagine having tea with a friend… this simple yet effective little tray helps eliminate that awkward moment when you don’t know what to do with your tea bag. This is a moment that most tea drinkers have experienced… You don’t want to put it on the table – it will ruin the table or stain the tablecloth! You don’t want to use your napkin – that will render your napkin useless. And you don’t want to put it on your saucer – because it will result in a messy, gauche saucer. Having one of these cute, inexpensive tea trays (they’re just $6.00 for a package of two trays) gives you a place to put your tea bag while adding a sense of elegance to your tea table. What I think I like most about these little trays is that they can suit just about any type of style desired. They are minimalistic, and yet, they can be whimsical, cute, charming, elegant and even somewhat masculine, if you want them to be.